Tiare is a newly built phinisi-style yacht that accommodates up to 14 guests in 6 cabins. Tiare began as the dream of 5 cousins in Italy, realised by the master builders of southern Sulawesi with careful design, sturdy and beautiful sustainably sourced materials, with high-tech components and safety equipment adding the final touches. 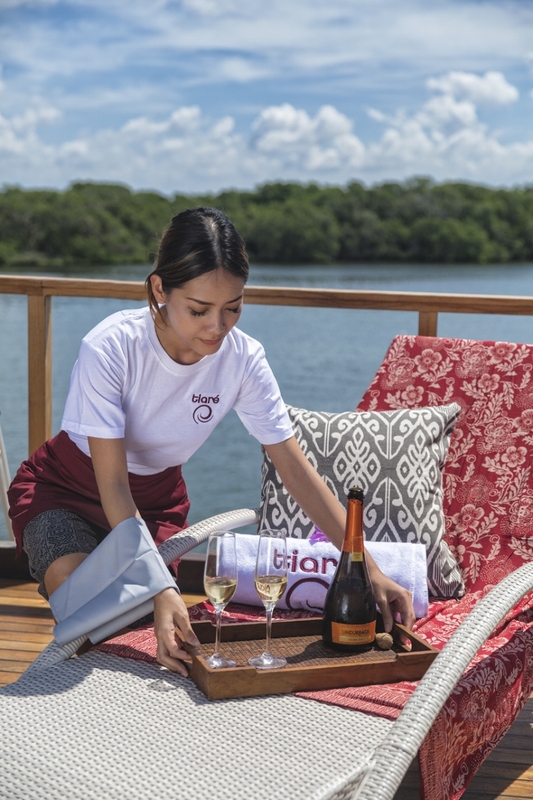 Tiare is dedicated to offering a luxurious dive-focused experience and features elegantly appointed interiors with highlights including a spa and a cigar lounge. 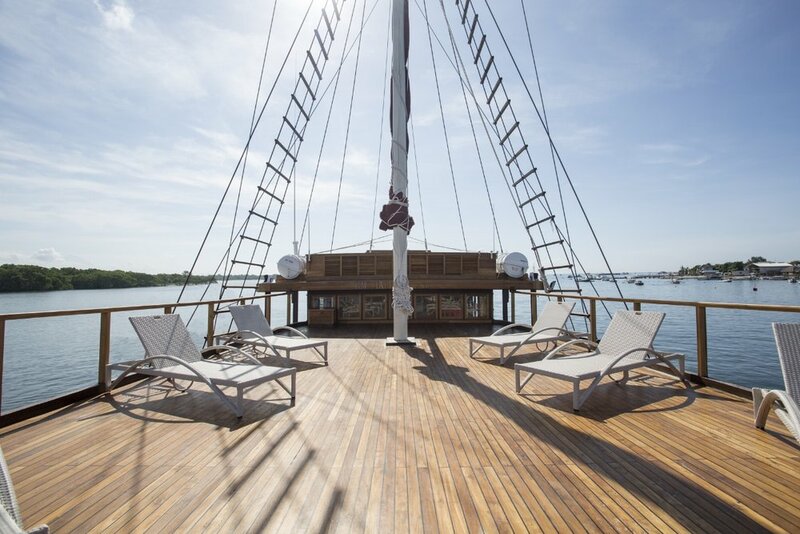 All living areas, decks, and cabins are built with antique teak salvaged from old Joglos, which not only gives the feel of “real Indonesia”, but also contributes to the yacht’s sustainable ethos. 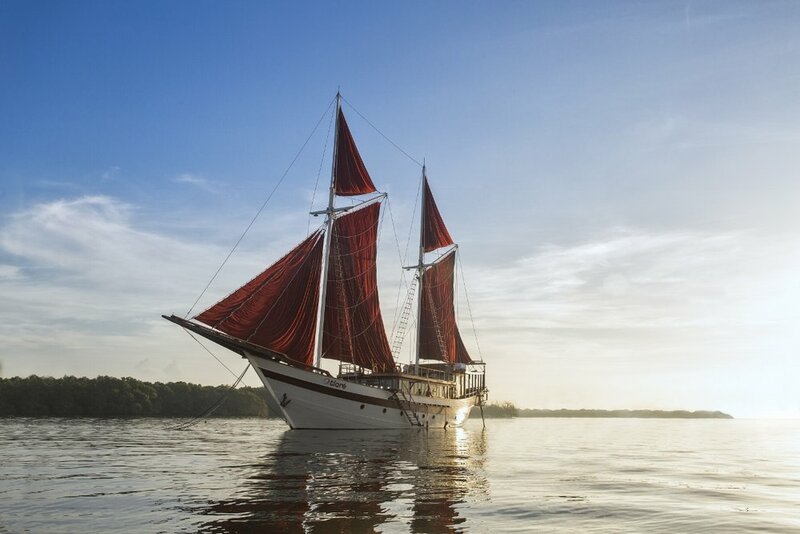 With a keen focus on diving in remote regions of Indonesia, Tiare has been fully equipped to cater to adventurous expeditions and has a crew of 15 to attend to guests, including 2 chefs, 2 dive guides and a cruise manager. Tiare features 6 spacious air-conditioned ensuite cabins. Two cabins feature a king- size bed, two cabins feature a king-size bed and a single bed, and two cabins feature twin beds. Guests are treated to soft linens and ambient lighting, with bathrooms complete with hot showers and environmentally friendly body wash and shampoo. Inside on the main deck, there’s an airy main saloon with plenty of space for dining around two tables, while a separate library and lounge offers a quiet space to retreat to in the heat of the day. A bar stocked with imported wines and a selection of other drinks is a welcome treat after a day of diving and a small cigar store is available for cigar enthusiasts. There are PCs where guests can edit photos or videos and also an indoor camera room, which has plenty of room to store lenses, charges, lights and spare cameras. Also situated on the main deck is a dedicated spa where guests can enjoy a massage. Tiare is equipped with air-conditioning, wifi, a stereo system, a computer and ipad, a fully equipped dive station with nitrox, 2 kayaks, 1 water walk, as well as diving and snorkelling equipment for guests’ use. Tiare was built in 2016 and spans 40m. 6 cabins accommodate up to 14 guests.